Symposium: "From Okinawa to Toyako: Dealing with Communicable Diseases as Global Human Security Threats"
PM Fukuda, former PM Mori and Michel Kazatchkine of the Global Fund. 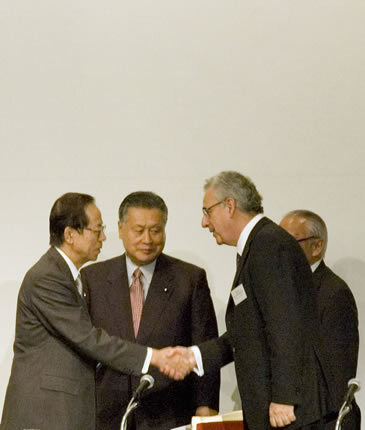 On May 23-24, 2008, more than 150, NGO, business, and philanthropic leaders from around the world met in Tokyo for a major FGFJ conference to explore how the world can respond more effectively to the spread of communicable diseases in developing countries. The conference, which was co-sponsored by the Global Fund to Fight AIDS, Tuberculosis and Malaria and the Japanese Ministry of Foreign Affairs, opened as Japan was preparing to host two prominent international meetings—the Toyako G8 Summit in July and the Fourth Tokyo International Conference on African Development (TICAD IV) from May 28. Sadako Ogata, president of Japan’s ODA agency, the Japan International Cooperation Agency, gave a keynote address in which she stressed the importance of human security approaches in working to improve global health. Then, during the conference’s first full session, Michel Kazatchkine of the Global Fund, Peter Piot of UNAIDS, and Joy Phumaphi of the World Bank shared their assessments of the progress made since 2000 G8 Summit and how much more remains to be done. 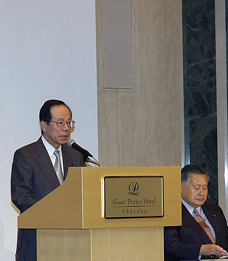 In later sessions, Keizo Takemi presented the findings of a major working group that has been preparing global health proposals for Japan for the G8 Summit, and leading figures from diverse fields shared their views about how to more effectively build cooperation between different regions of the world and different sectors of society in responding to the global challenge of communicable diseases. For more information, see the announcement of the contribution from the Japanese Ministry of Foreign Affairs.